So all that matters to you is that a white man did it? That's not prejudiced at all. Oh no, I see your problem. You're upset because we like to piece things together for ourselves and think about it instead of just letting some person on the TV tell us what to think. If it was a Muslim that did it, it would be terrorism...just like the murdered journalist last week. You disagree? Even UK has no problem calling it for what it is in similar situations. You cant because you're part of the problem. And that's ok...you dont know any better. Piece what together? Telling the OP to change the post because they assumed without doing research when the OP was accurate? That makes sense lmfao...you actually read AND comprehend what you're saying? Because it def. Doesn't seem like it. If it was a Muslim that did it, it would be terrorism...just like the murdered journalist last week. You disagree? I haven't seen anyone arguing over domestic terrorism in this thread. Have you? We were putting together the story from the fragments coming in. It might interest you to know that this thread was pretty typical of a breaking news thread. It had people in here of all political persuasions putting together what happened. Most of us, being less trusting of the press for a variety of reasons, like to put together the story through what we gather, so everyone monitors their media sources of choice from police scanners to TV reports, local and national, to Twit streams. We scour social media and everything else we can. We usually try to keep such things as political sniping out of the thread although it doesn't always succeed because the focus is to piece together the actual story of what really happened or is taking place. This isn't the place to argue over domestic terrorism. If you want that, doubtless there or will be other threads on it. If there aren't, go start one. 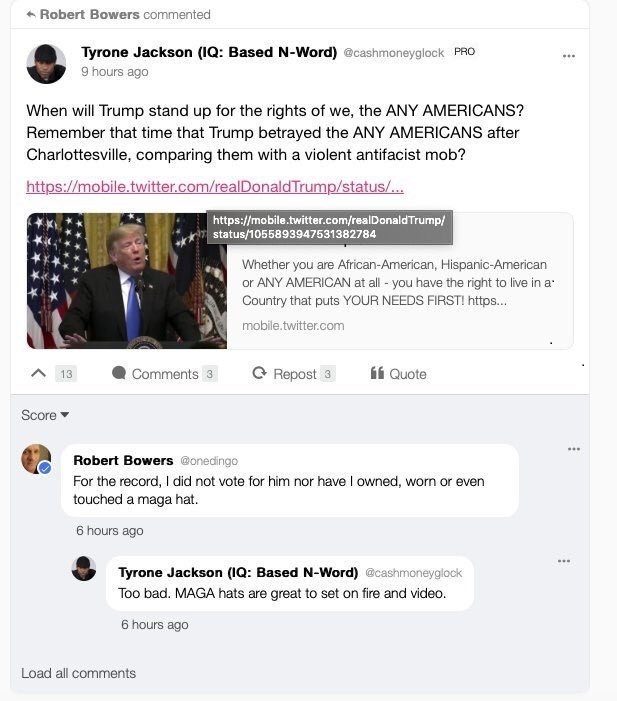 Heck, I just noticed a thread on whether or not Cesar Sayoc is a domestic terrorist. If you take yourself over there and couch it right, your concerns might make an addition to that discussion. trump said some of those domestic terrorist are fine people...remember? Hint, if it's domestic terrorism, it's already political in nature. ETA Yep, Russian trolls are at it again! But according to Trump, this isn't domestic terrorism is it? Despite the same # happening all over the world and it being labeled as such...in America, it is murder...or so says our fearless leader. Because there were people on both sides that were there to protest peacefully comrade Olaru. There were people there not affiliated with the Nazi's that were there to protest the removal of a statue that was part of their heritage. I guess Rawstory failed to fill you in on that FACT? If you continue to promote that lie you yourself are a liar! I wonder how the media is going to spin the optics on this one.